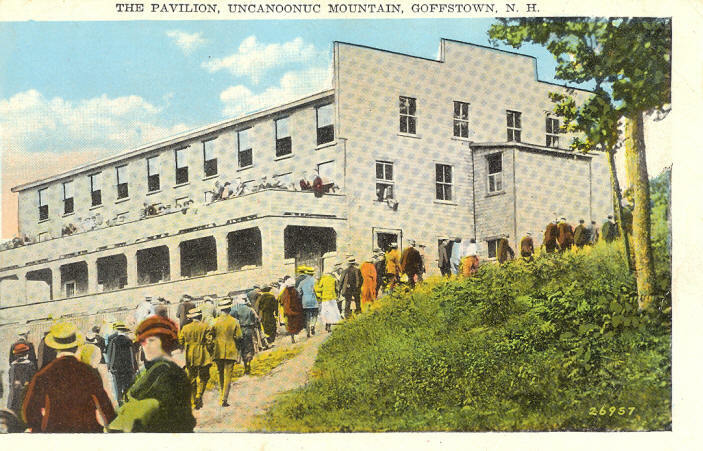 Uncanoonuc - an Indian name that means "woman's breast"
Located entirely within the town of Goffstown, with an elevation of 1321 feet. The range consist of two mountains north and south. 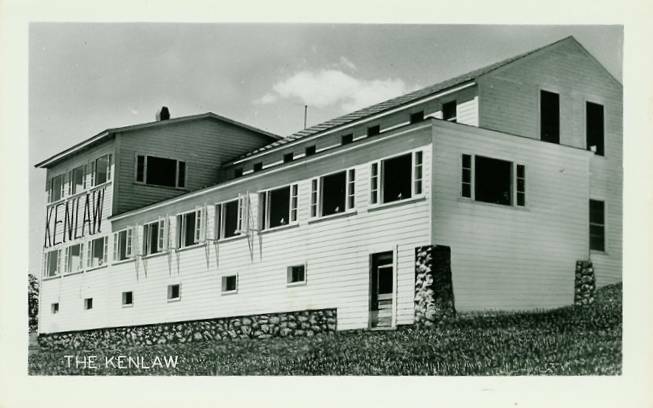 The mountains have seen many uses over the years including hiking, skiing, fire lookout, summer resort. 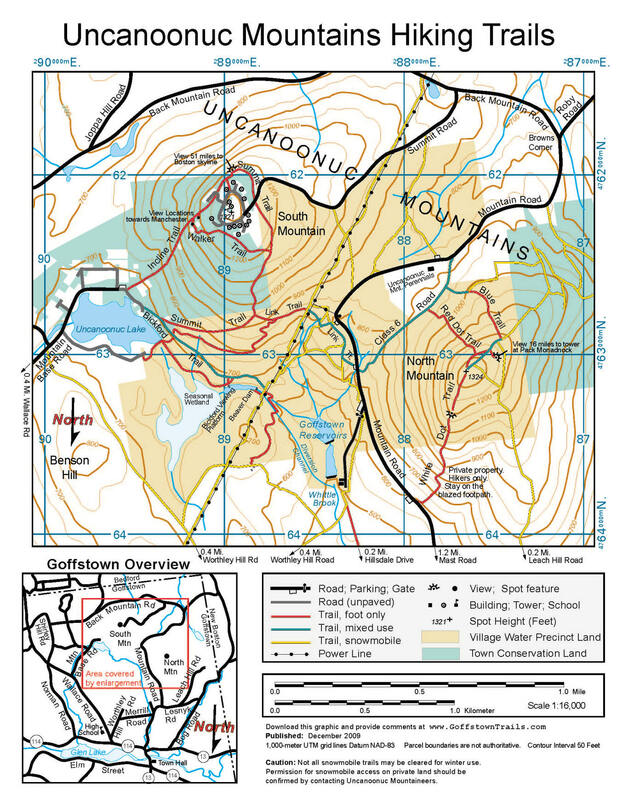 June 12, 1877 a charter was granted to the Uncanoonuc Road Co. to build and keep in repair a road, starting from Mountain Road to the summit of Uncanoonuc Mountain. Dedicated September 1877 the Pierce family who's home set back off of Mountain Road acted as toll gatherers. Toll fees were 10 cents for walking up the road and 25 cents for a horse and carriage. The road was abandoned upon completion of the Incline Railway in 1907. Of the two, south mountain has been used heavily for recreation. 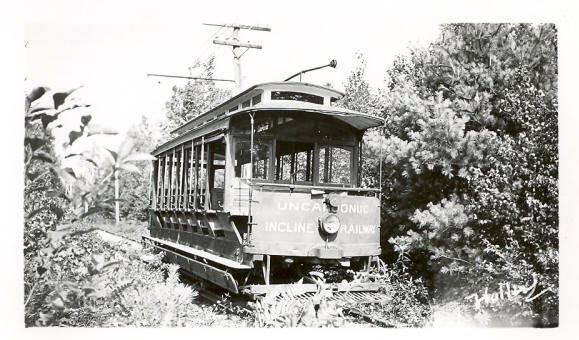 On the 25th of March, 1903, certain citizens of Manchester and towns of New Hampshire led by J Brodie Smith were incorporated under the name of the Uncanoonuc Incline Railway and Development Company, and were given power under their charter to construct, maintain and operate an electric railway from some point near Shirley Station (intersection of Wallace Road and Mast Road) to the summit of the Uncanoonuc Mountains and also to construct suitable buildings upon the summit for the convenience of the traveling public, all of which must be constructed within two years. 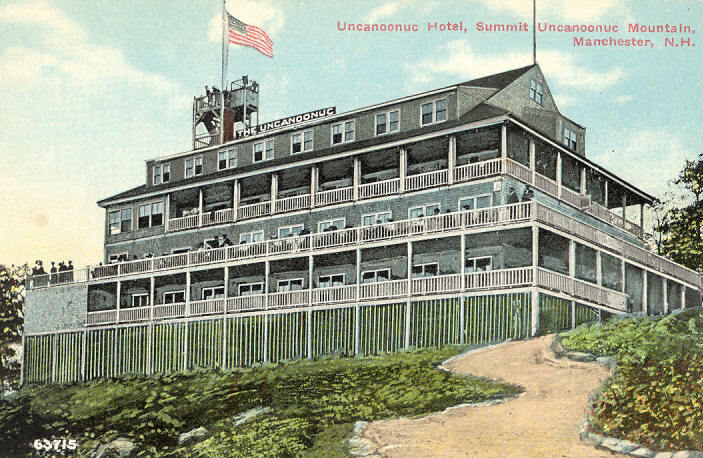 The cable car line up Uncanoonuc also served to promote the building of summer homes on the mountain, one of which was owned by J Brodie Smith a pioneer in the electrical industry in New Hampshire. The first part of the line was built as a two and a half mile conventional streetcar line. The line branched off the Manchester Street Railway at Shirley Junction and went to the base of the south mountain. A streetcar ride from Shirley Junction to the base station took 15 minutes, but since the conventional streetcar line was on a 4.5 percent incline, it took only 6 minutes to return to Shirley Junction. At the base of the mountain was a transfer point between the conventional line to the incline. It wasn't until June 8, 1907 when the railway opened. The ruling grade of the incline was a grand 35% and the running time was five minutes. Equipment on the incline was two open cars that were connected by a steel cable and were operated like counterbalances. Each incline car was equipped with two 40-horsepower motors and carried a motorman and conductor. Today at Uncanoonuc one can find traces of the railway with remnants of hardware scattered along the incline. 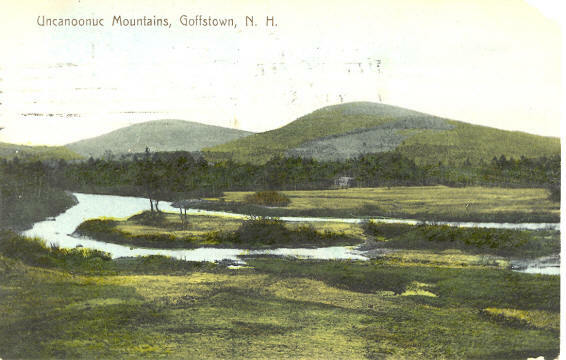 Perhaps one of the more interesting monuments besides that of the various foundations left behind, are the bodies of four Manchester "Rapids" at the base of the mountain. 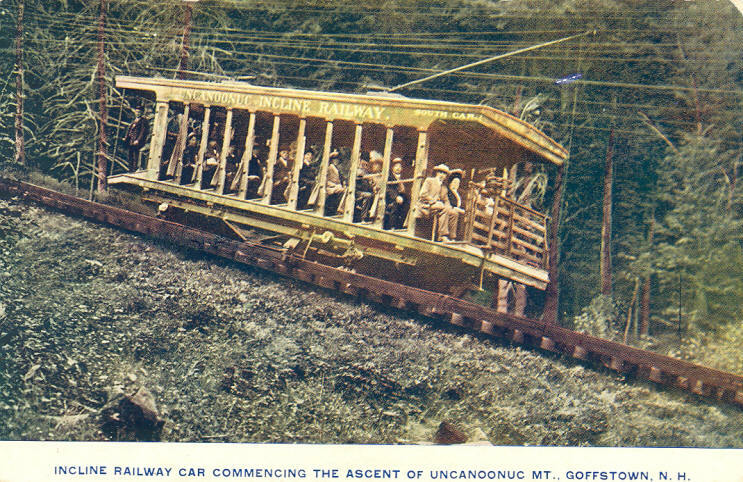 When the Manchester Street Railway ceased using the interurban cars, five of them were left at Uncanoonuc, four at the base and one on the summit. The car on the summit was stripped by members of the Seashore Trolley Museum for restoration of Manchester & Nashua St. Ry. #4. The other four cars at the base are there today, serving at residences. In the early years the biggest users of electricity were trolley cars which were used heavily during the work week. In an effort to encourage weekend rider ship many electrical suppliers such as Manchester Traction Light & Power Company who owned and operated the trolleys, developed properties on the outskirts of towns providing entertainment for riders and new income opportunities. In the Manchester area the list includes Massabesic Lake, Pine Island Park 1902 -1963, Uncanoonuc Mountain 1907 - 1940 and Canobie Lake Park (1902) which is still in operation today. Listed as a temporary station in 1911, the lookout appears to have been on the roof of the summit hotel built in 1907. 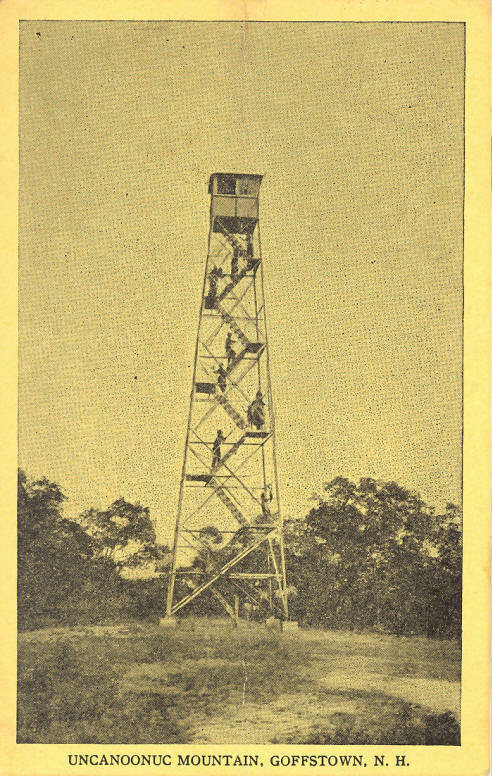 This hotel replaced what seems to have been a 40' observation tower built about 1877. As early as 1850 a passable road to the south summit had been built and the US Coast Survey established a station there that year and again in 1860. In the following years Professor Hitchcock and Quimby had stations there. 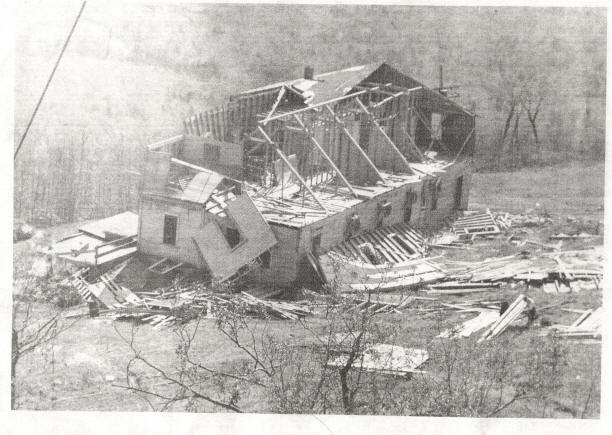 The mountain hotel burned in 1923, and in 1926 a new 80' steel tower was put in place. The station remained in service until 1981 and was removed soon afterward. Uncanoonuc Lake is contained by a dike one one end and a dam on the other. The dike is 16 feet high and 131 feet long, construction completed in 1954. Built in 1936 the dam is made of concrete. It's height is 9 feet with a length of 147 feet. Maximum discharge is 97 cubic feet per second. The lake is supplied by and feeds into Dan Little Brook.